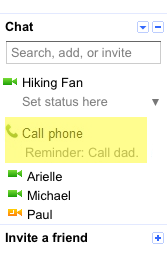 Official Google Blog: Give Dad a ring with free calling from Gmail in the U.S.
Give Dad a ring with free calling from Gmail in the U.S. If you’re in the U.S., you can use Gmail to make free domestic calls and calls to Canada. If your dad lives abroad, we have some of the best rates around, like two cents per minute to Australia, Argentina, France and many other parts of the world (unfortunately, those of you outside the U.S. will have to phone Dad the old-fashioned way). And in case you don’t read this post in time, we've added a small note in the Gmail chat roster, right under the “Call phone” link, to remind you to give him a ring. Happy Father’s Day from Gmail! Today is Father’s Day in many countries around the world, so whether your dad lives across the street, across the country or across the ocean, it’s a good day to let him know you’re thinking about him. Of course, email is a simple, quick way to check in with your old man, but it’s just as easy—and maybe even more meaningful—to call him right from Gmail.